Fifty years ago, in 1963, a new icon was born. As a youth trend in California reached through the echelons of business circles, the Schwinn designer for engineering, research and development at the time, Al Fritz, created a bike that every kid wanted. A bike that made kids who were too young to drive cars feel cool as they pedaled out onto the roads. The trend involved taking embellishments that were previously only used by motorcycles and adding them to bicycles. The bike was the Schwinn Sting-Ray. Between the years of 1963-1968, Schwinn sold around two million of these bicycles with Al leading the way at the forefront of the design. His contributions to the community of bicycle design were so great, in fact, that in 2010, Fritz was inducted into the BMX hall of fame. Now, in celebration of their 50th anniversary, Schwinn commemorates the 1963 Sting Ray classic with a special edition bike known as the Fritz-Fifty. The last project with Schwinn that Fritz was to have a hand in before his passing. Fritz, who was diagnosed with Alzheimer’s in 2009, passed away on May 7th of this year at the age of 88 due to complications caused by a stroke. But Fritz did not leave before restoring new brilliance to an old classic. 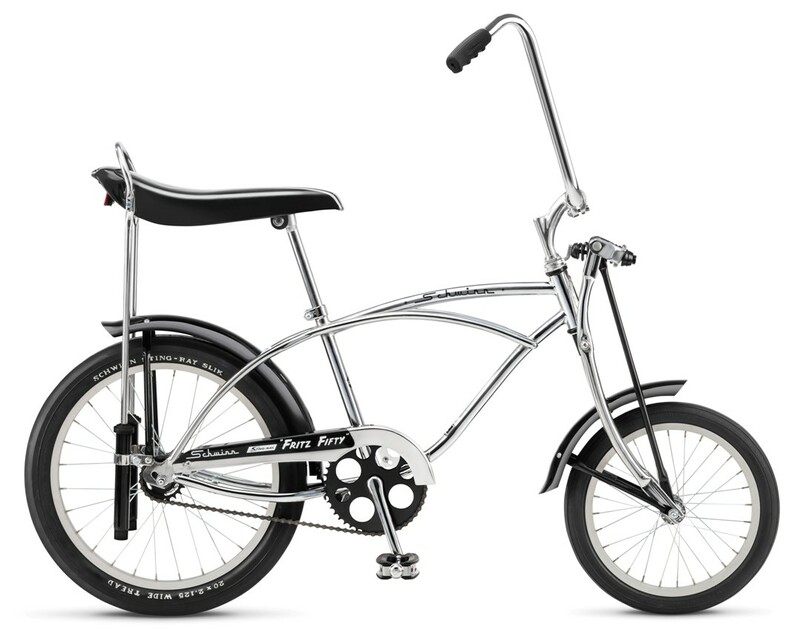 The Fritzy-Fifty marks the introduction to the Schwinn product line of the first newly designed Krate Sting-Ray since 1973. While other versions of the loveable classic have been released previously, nothing quite like this has made it to the shelves before. All the old details that made the original design famous are still present in the new model. The classic frame, the banana seat with rear suspension, the springer fork, the fat silk rear tire and the smaller 16-inch front tire, along with the fenders for all-weather riding will remain the same in the new design. The major difference is that the Fritz-Fifty marks the first time the Sting-Ray will appear with a chrome fame, an addition that, according to Schwinn’s media contact Silvie Snow-Thomas, had long been a dream of Al’s. As a result of Fritz’ struggle with Alzheimer’s, the release of the new Schwinn 50th anniversary commemorative bike is seeking to give back. A percentage of the proceeds earned from sales of the new bicycle will be donated to the Alzheimer’s Association in honor of Fritz’ memory. According to the Alzheimer’s Association, the disease affects more than 5 million Americans and causes, along with other forms of dementia, 1 in 3 American Seniors to die each year. In total, only 500 of the collectible Fritz-Fifty bikes will be available for exclusive purchase from certain independent bicycle retailers during the first week of December. “The creation of the Fritz Fifty Limited Edition Schwinn Sting-Ray is a testament to the incredible contributions of bicycle design by Al Fritz and Schwinn’s commitment to the heritage of our brand,” said Jeff Rogers, Global General Manager at Schwinn. Lauren Bringle is a young idealist with a taste for adventure and passion for yoga. As Editorial Manager for Conscious Connection, she's committed to our mission of delivering enlightening content with your best self in mind. She loves the space where culture, movement and the written word combine to create physical and mental healing.